No other country on earth has contributed as much to the rich history of tea or to the discovery and understanding of tea cultivation and tea manufacture as China. During the illustrious dynasty periods of Chinese history, the six main classes of tea (black, green, oolong, Pu-erh, white, and yellow) were created one by one as tea workers continually refined the tea-making process. Experimentation with fresh leaf led to new techniques with differing results, and the teas that we know today were born of these early efforts. 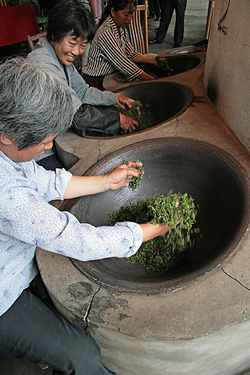 Today, from east to west across the great expanse of China, unique varieties of hand-made artisan tea continue to be crafted in remote rural tea villages in tea-producing regions. There, tea gardens are protected and nurtured by the isolated environment of high-elevation locations in lofty mountains, which provides the perfect climate and growing conditions for producing stunning teas. China’s most famous and delicious teas are only made just once-a-year in the season that will yield the best flavor for that tea. Many of Tea Trekker’s seasonal Chinese teas sell out quickly upon arrival to our shop.